MovieScore Media storms the beaches and infiltrates the forests with its latest release for Dominic Burns’ Allies, a stirring WWII drama scored by French composer Philippe Jakko. The versatile orchestral underscore ranges from epic battle set pieces (”Opening”, ”Forest Battle”) to nervous ambience suspense ("German Camp") and touching, lyrical moments (”Brothers”, ”Harry and Catherine”), celebrating the beauty of humanity in the middle of the war. While the music clearly favors the lower range of the orchestra with a heavy reliance on celli, alti, double basses, horns and snares engaged in furious ostinati, a handful of lyrical moments heighten the emotional impact with a choir as well. 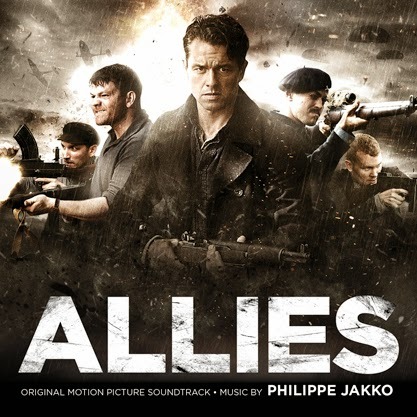 Allies composer Philippe Jakko graduated in musical high schools in Paris and Lyon where he studied harmony, counterpoint, composition and conducting with a music degree in musicology (on film scoring). Philippe is also a multi-instrumentalist: he plays the piano, guitars, keyboards, bass and the Arabic oud. His music for Valérie Donzelli Que D'Amour! was nominated for the Best Score at Festival de La Rochelle in 2013. Apart from film scoring, Philippe is also active in the world of ballet, he composed a hip hop opera and wrote several hit songs: "Yakalelo" (1998) and "Parce qu'on sait jamais" (2008) sold over 1,500,000 copies.